When the Cubs went crazy in the 2015-16 international free agent class, it became apparent quickly that the new group of players was going to help restock the system more than the any draft would. That became even more evident with the quick ascension of Aramis Ademan and then Miguel Amaya. Outfielder Jonathan Sierra seems to be on the cusp of breaking out but is not quite there yet. Pitcher Brailyn Marquez seems to be rising quickly and the next name you’re going to hear in 2019 is infielder Yonathan Perlaza. The hardest thing to do in scouting is to take a 16-year-old kid, who has been trained in the ways of the showcase, to play baseball. They usually tend to lack game experience, in-game skills, and it can sometimes take a little longer to get going. For Yonathan Perlaza, that seems to be the case. 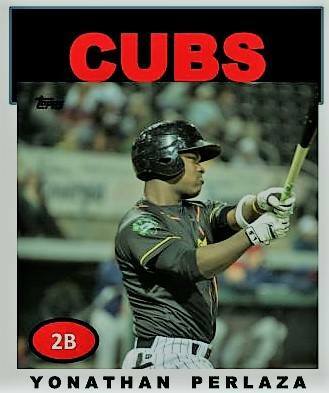 He now has three seasons in as a Cub, although they are all at short season levels in the Dominican and in Mesa. I realize his 2018 season has been quite the eye-opener. When the Cubs signed him back in 2015, he was one of the top 30 International prospects that year. Here is what Jesse Sanchez of MLB Pipeline had to say about him that back then. Perlaza might not be as “toolsy” as other players in this year’s class, but scouts like the infielder’s bat and consider him one of the better hitters on the market. Moreover, he’s been praised for his swing and strong wrists, leading some scouts to believe that he could hit some home runs and drive the ball into the gaps on a consistent basis in the future. Perlaza is considered a decent defender at shortstop, and he could stay there as he develops. There’s also the belief that he’ll end up at second base. He’s not the fastest runner, but scouts like his effort and hustle on both sides of the ball in games. He’s considered fundamentally sound in all areas of his game, but it’s his bat — now and in the future — that makes him an appealing prospect. This “gamer” signed with the Cubs for $1 million. Perlaza‘s first year in the Dominican went fairly well. He hit .256 with an OBP of .311. His K rate was not too bad at 20%. In 60 games, he did hit 3 HRs and drive in 18. However, he spent most of 2017 on the injured list at Mesa. He only got in 25 games with just 102 at-bats. But 2018 has been eye-opening. He’s made two monthly Cubs Central All-Star teams for his outstanding bat while playing a mixture of second and third for Cubs 1. For the season, he hit .317 with a .365 OBP in 183 at-bats. His wRC+ of 119 is outstanding and bodes well for his future. In the playoffs, he went 8 for 14 with 2 BBs for an insane OBP of .647 in 4 games leading Mesa all the way to the Championship game only to lose to the Dodgers. But his season didn’t end there. Perlaza found himself in Eugene the day after Mesa ended its season. He got in 2 regular season games and was assigned to the playoff roster. His only action game in the bottom of the ninth in game 3 of the championship series. He reached on a fielder’s choice and came around to score the winning run on a balk. When 2019 rolls around, Perlaza should be competing for a spot at South Bend. I look forward to seeing him on an everyday basis at the plate and in the field. After all, he’s only going to be 20 for the entire 2019 season.